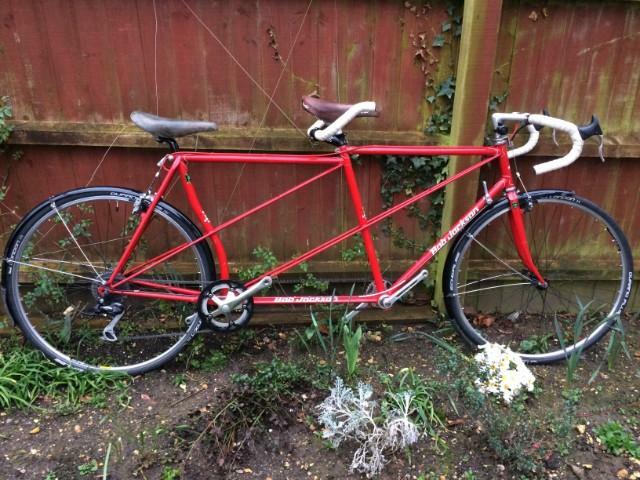 Bob Jackson Lightweight Racing Tandem, Reynolds 531 Tubing. Very good condition, Built in 1979 I believe. Weighs 35.6 lbs as pictured, lighter if mudguards removed and the (included) race wheels fitted. Currently has a 42 tooth chain ring and 8 speed 11-32 cassette. A 56 Tooth chain ring and crank arm included in the sale for very fit people! Shiimano V brakes with new pads, Alvio rear derailleur with frame mounted friction shifter. Tectra Brake levers. One Sella Italia Turbo Saddle and one Cinelli. Lovely bike to ride and gets lots of attention at coffee stops.